Widely distributed and generally common throughout England, Wales and Scotland including, with the exception of the Scillies and Lundy, all our islands north to and including Shetland (NBN Jul 09). The species occurs in a wide range of wetland habitats including streams and rivers, lake margins and ponds, sphagnum and peaty pools and also in brackish water environments, the common requirement being abundant vegetation, but they also occur in temporary environments eg during June 2009 we found many adults, along with Agabus bipustulatus, in flooded tyre ruts in the New Forest and, during the 1980's, we found them regularly in a cattle trough in Ruislip woods, it is therefore worthwhile searching any body of water for the species although, as noted by Balfour-Browne, where there are several apparently suitable ponds etc in close proximity fuliginosus may occur in only one. It is common and sometimes abundant throughout our Watford area and, at least locally, seems to prefer weed-choked stagnant ponds. Numbers vary widely from year to year eg during 2008 we found only a single specimen, in the pond below Cassiobury park, whereas during June and July 2009 they have been abundant throughout. The beetles are good fliers and fly readily, having been recorded widely at light. Winter is passed in the larval as well as the adult stage; adults out of water within nearby soil, under debris or among moss or vegetation, they leave the water in September or October and become active towards the end of April. Oviposition occurs from June until the autumn. Eggs are inserted within plant tissue, two examples given by Jackson (1960) are within hollow air-filled leaves of Jincus or among air spaces in Alisma leaf stalks. In the absence of suitable plants eggs have been recorded as deposited on Sphagnum or among filamentous algae. Eggs likely to be those of fuliginosus have been found in Jincus bulbosus leaves only 0.9mm wide! Eggs deposited on algae etc rather than within plant tissue go on to develop and hatch but, presumably, are not afforded the protection from parasites or predators gained from being inserted. It is likely that beetles laying eggs early in the summer will have overwintered as adults, those laying later may be from eggs laid the previous autumn; Balfour-Browne notes first stage larvae in August and third stage larave in November and December, and Jackson (1960) notes fresh (soft-bodied) adults during June and July (in Fife). From eggs laid in early August a larvae obtained (in the lab) fed through the autumn and winter into mid-Feb when it buried itself into the soil, a soft bodied female emerged in early May. In the wild this would probably have taken longer and, as these 'fresh' females were recorded as having ovaries 'minute and quite immature', it seems that these will lay late into the summer or autumn. Jackson also stated that some apparently mature, ie with hardened cuticle, females collected from June to August also had immature ovaries. During the summer adults from the two generations will overlap and occur together; overwintered adults ovipositing from early summer and new generation adults ovipositing in late summer and autumn. 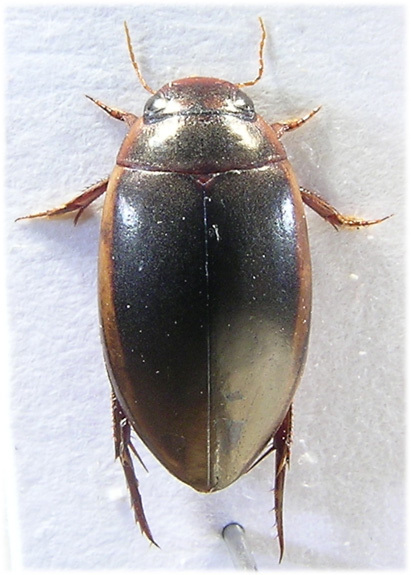 Identifying many of our water beetles from keys or descriptions relies on examination of underside characters and, in many cases in order to be quite confident of the identification, dissection and examination of the genitalia. 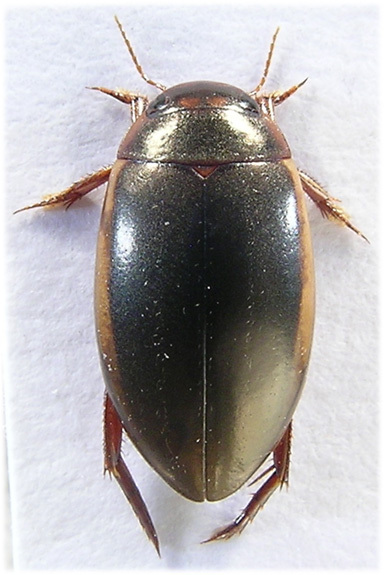 I.fuliginosus, however, can be confidently identified by its size and general appearance and so the following description is restricted to upperside morphology. A distinctive species which soon becomes obvious in the field, elongate and with a somewhat parallel sided appearance, large and uniformly dark with a (sometimes faint) dull metallic bronze lustre, sides of pronotum and elytra with strongly contrasting pale borders. 10-11.5mm. Eyes convex and emarginate to front edge. Labrum, clypeus and two spots between posterior margins of eyes rufous; this lighter colouration may be more extensive on the vertex. Antennae and palps testaceous. Entire upper surface with fine microsculpture which is irregular in shape but individual cells are about quadrate, not, overall, elongate or transverse. Pronotum strongly transverse and finely bordered laterally and anteriorly, this border continues a short way along the posterior margin from the perpendicular hind angles. Front angles strongly protruding. With 2 or 3 transverse series of punctures behind front margin (sometimes indistinct). Pale lateral borders are not sharply delimited but merge with the dark ground colour, this pale colouration may extend a short way along the anterior margin. Scutellum broadly triangular, microsculptured and coloured as surrounding elytra. Elytrl suture bordered by a series of fine punctures, upper surface with three longitudinal, albeit rather random, series of punctures. Pale margins broad and not quite reaching apex, in our specimens these are divided posteriorly from about middle by a longitudinal dark mark. Legs rufous or dark rufous. Hind femora with a short series of erect setae on hind edge near apex. Meso and meta tibiae and tarsi with dense long swimming hairs along the upper surface, obvious at X20. Posterior margin of metatarsomeres sinuate and produced into a short lobe below (view from side), ventral surfaces with a fine longitudinal raised bead. Protarsal claws elongate and almost straight, the outer claw slightly shorter and narrower, Mesotarsal claws elongate and weakly curved, about equal in length. Metatarsal claws unequal; outer claw broader and more curved towards apex, about 3/4 length of inner. Male with pale sucker hairs below pro and mesotarsi. Underside predominately dark testaceous. Jackson, D.J. 1960. Observations on egg laying in Ilybius fuliginosus and I.ater with an account of the female genitalia. Transactions of the Royal Entomological Society 112 part 3:3-52. Jackson, D.J. 1773. The influence of flight capacity on the distribution of aquatic coleoptera in Fife and Kinross-shire. Ent.Gaz.24:247-293.